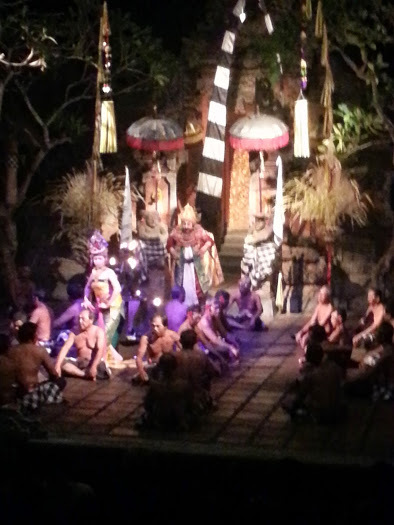 We went to a neat evening Kecak dance show which consists of lots of chanting by many men. They provide all the music for this by group grunting and chants. Sounds off-putting but it’s very compelling. Then a story is acted out with dance and show ends with one of the characters walking and then sitting on a large fire and jumping around on it. He was wearing a grass skirt at the time so not sure how all that worked. 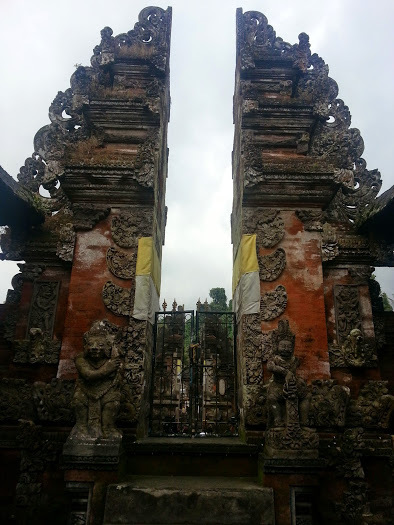 Every house here in Bali has its own temple. If the house is the Balinese style compound then it’s quite a large one but even small places have little temples outside. And everyone puts out little trays of offerings each morning during prayers. These are leaf bowls with flowers, fruit, rice, candy, often a cigarette, etc. inside. You have to step over all of them on the sidewalks and driveways as they are outside each house or shop. These are done to thank the gods for what has been given and is a constant everywhere. 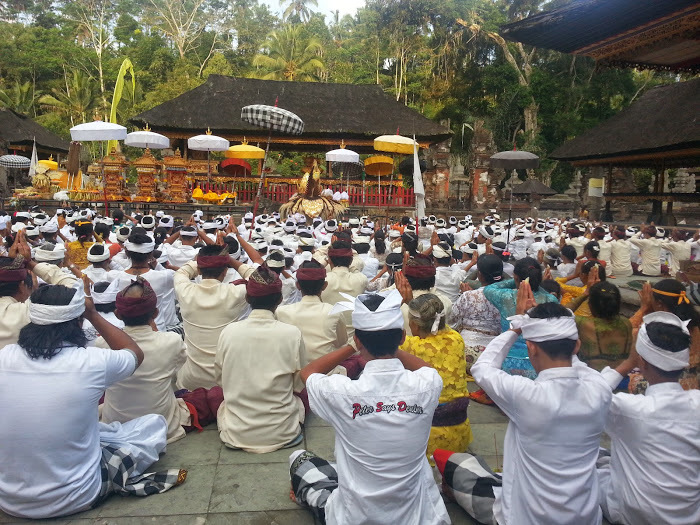 People also visit the temples and celebrations crop up many times. We stopped at one temple and were lucky enough to catch a big event that re-dedicates the temple and happens every six months. Lovely dancers and watching the holy man bless the water and then sprinkle it on everyone was interesting. Children were with their parents and chatted and wandered around but there was no crying or running around misbehaving. Parents did not mandate the children sit down quietly but they just did – with no tears or stress. Very rarely do you see a baby or young child crying here as needs are taken care of and children are cherished. We have also seen a few cremations including one in the parking lot next to where we enter our spot of the beach. It involves many hours of music playing and people sitting in chairs talking and eating before they set the sarcophagus on fire. 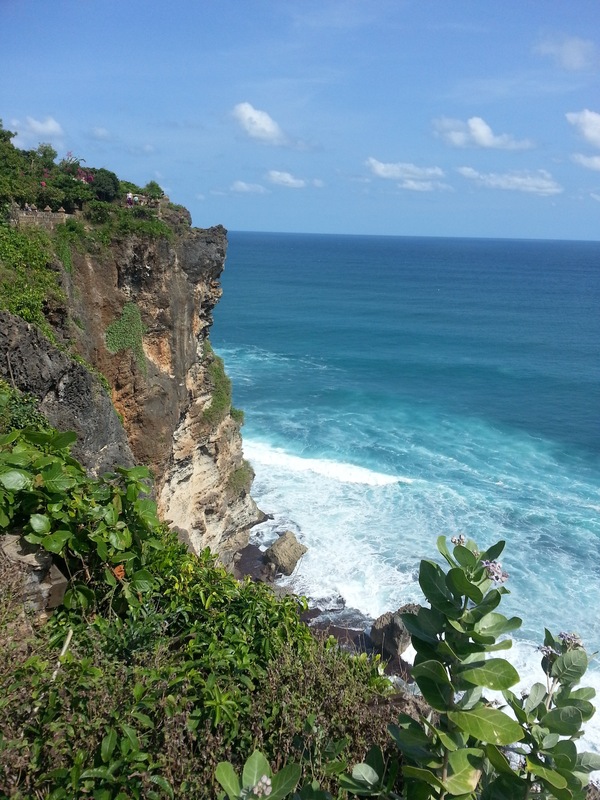 Each area of Bali has slightly different rules on this. 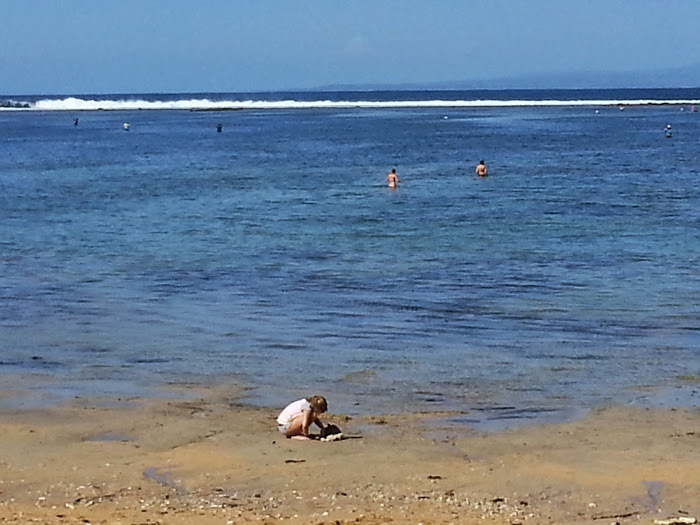 Here in Sanur, they will cremate right away if it is a natural death but if the person dies of an accident or suicide they bury the body for a year or so until an auspicious date is found whereupon they dig the person up, cremate them, and then sprinkle the ashes in the ocean. Further inland one cultural group does not cremate but covers the body with bamboo and leaves them under a tree to let nature take its course. I was told this does not smell. It was rather strange though sitting in our beach loungers with a cremation taking place a few hundred meters from us. Then I thought it rather nice. Better than standing in the cold and rain to say a few words at a gravesite. How nice for the family to sit around at the beach eating, drinking beer and perhaps telling funny stories of the person. I like that better! As a note, the pictures are not of the cremations as that felt too intrusive. 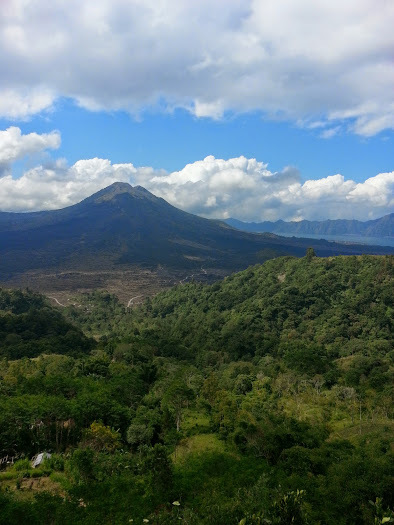 A trip around Bali had us driving up to see a volcano through very pretty jungle areas and past the famous rice terraces (it was raining so we visited those from the car). We had lunch overlooking the volcano, which was pretty but the food sad (should never do a buffet when there are that many tourists). Still, just as in Costa Rica, it’s all about the view from these places. 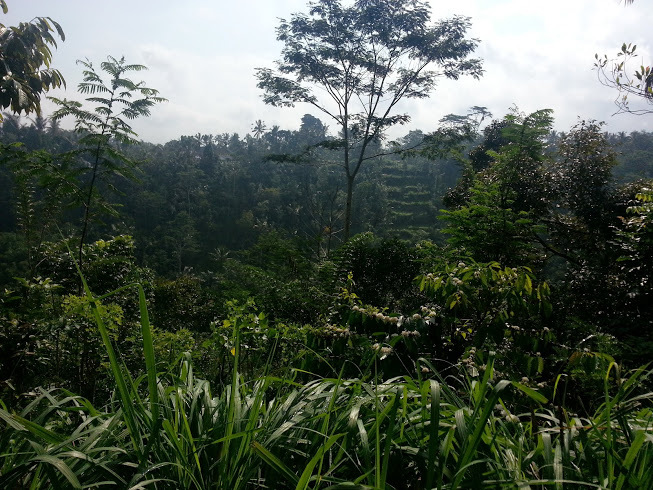 Coming back we stopped at a coffee plantation that also grows cocoa, tea and herbs for tea plus the famous cat-poo coffee. 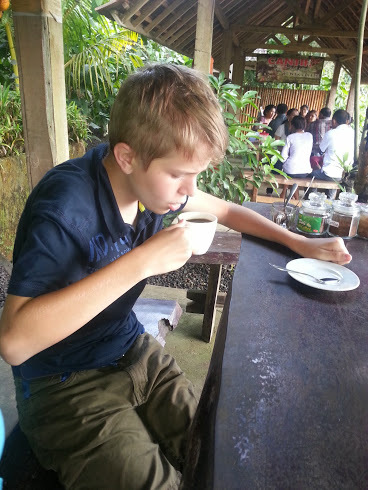 We sampled a cup of this which is made from the coffee beans that have been eaten and then passed through the gut of little weasel-like animals. They are then gathered up, roasted, ground and made into coffee. There is skepticism that many of the beans are actually not from this process – the place we went is “certified” but I don’t really know. Still it was a strange experience to feel as if we were drinking cat-poo coffee! It was pretty mellow flavor and OK really except here they make coffee too strong for my liking. 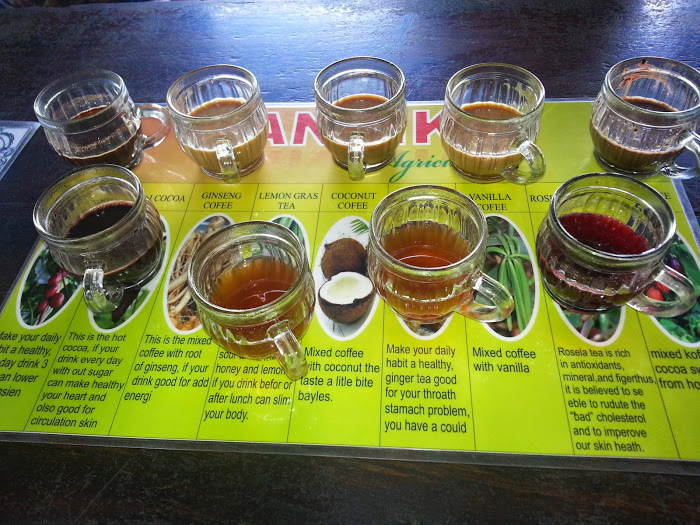 We got to taste all the other coffees and teas they make on the plantation and the coconut one was pretty much the favorite. It was fun to taste the variety. Another stop was at a big temple overlooking the ocean. It’s one of the four directional, water temples so pretty important one. The building itself is pretty plain and lacks decoration or grandeur but the views were wonderful. There were monkeys in the temple and we had been warned they grabbed everything and were a bit pushy but on this day they were laid back. We had skipped the monkey forest in Ubud because of reading other blog posts about being bitten by the monkeys there and since they carry rabies and we have had no shots, we thought it best to avoid. The dogs and cats (both are plentiful wandering around) also have high rates of the disease so we were always on guard with the kids not to pet them. 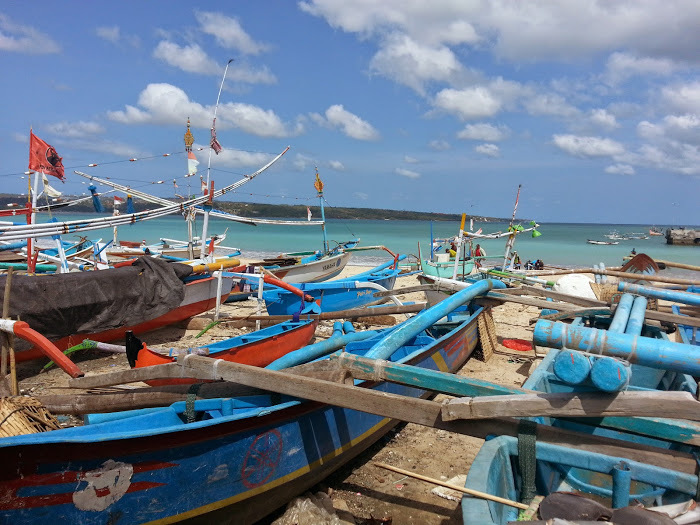 On one of our outings we went to the seafood market in Jimbaran which is south of Kuta on the west side. It’s in a lovely bay with whiter sand than we are seeing in other places and the water was almost turquoise but the waves were really large. Too intense to swim for sure. The sand though was nicer and softer. In Sanur it’s OK but right at the water’s edge it becomes very squishy with this unpleasant sinking feeling (above ankles) that is hard to walk in. 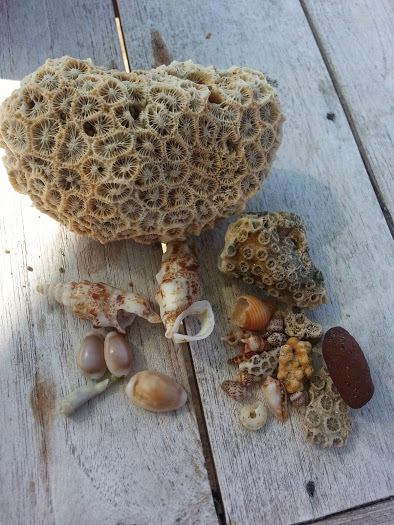 I haven’t experienced sand quite like it before – it’s like soft mud but yet quite large, round grains of sand. Anyway the fish market was interesting as the colorful boats pull in right next to it and unload their daily catch. 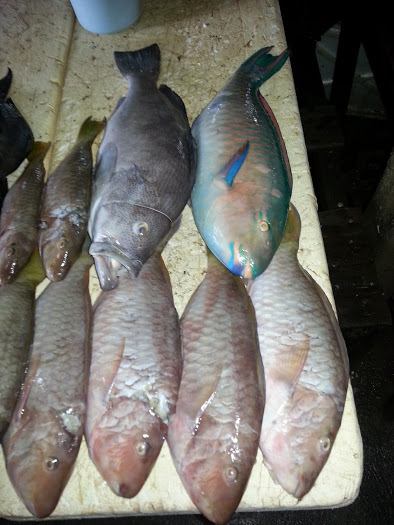 Lots of red snapper, some parrot fish, sharks and other unknown fish. Huge lobster and shrimp and a few types of shellfish. Outside there were lots of racks with drying fish too. Sad to see shark fins but since shark was being sold inside, I hope they used the entire fish in this case (think so). 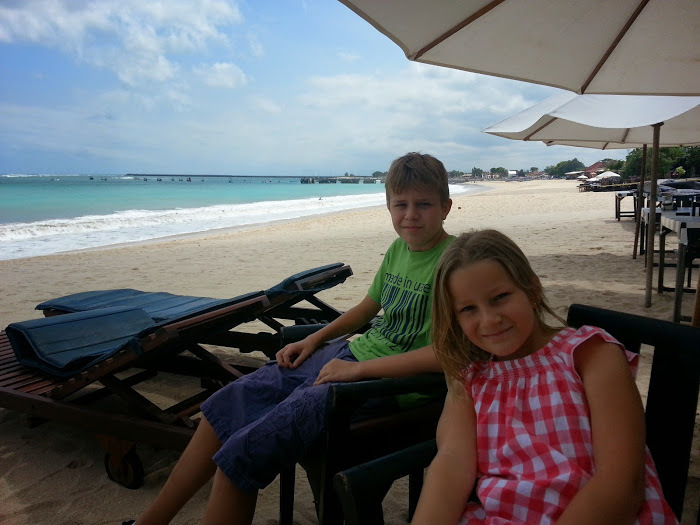 We then went a little further down to one of the many beach restaurants and ate lunch. They have tanks and you choose your own. We sent Jake in as that is just too hard for the rest of us to do. But it was delicious grilled red snapper and squid. 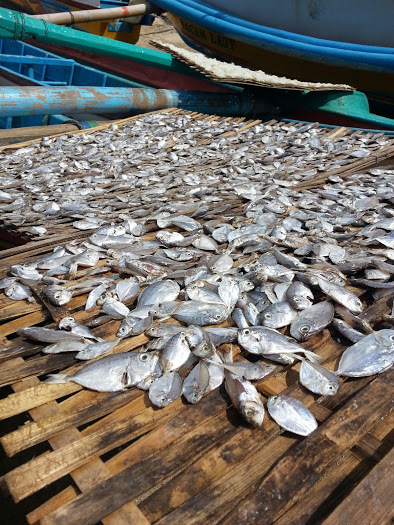 Couldn’t really have been much fresher as just caught that morning and then grilled to order on the beach. Pretty darn good food! 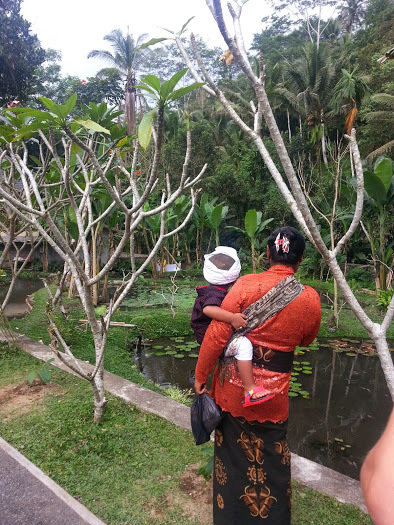 We just spent two weeks in Bali and overall enjoyed it but probably wouldn’t work hard to come back. The people are lovely; kind, gentle and very talented musicians and artists. 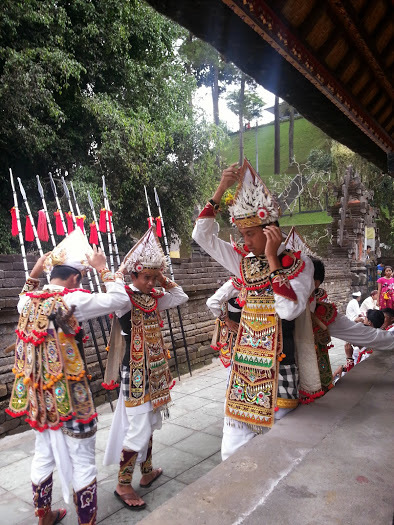 The culture is interesting and the temples and architecture fascinating. I had higher hopes for the beaches, which were pretty, but nothing amazing. The reef sits just off shore and that was neat to see as the waves crash out there encircling Bali. Reminded me of the desert island books where they can never get across the reef in rafts! 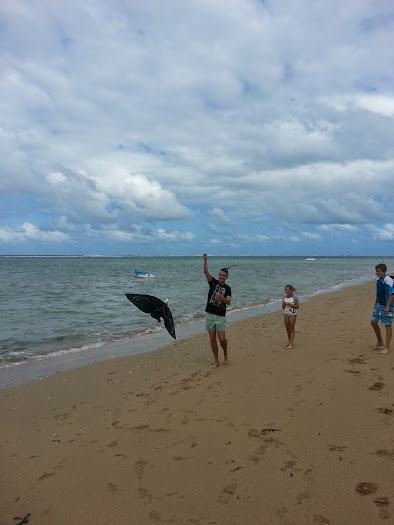 We stayed in Sanur, which is on the south east coast and the “sleepy” side of Bali. 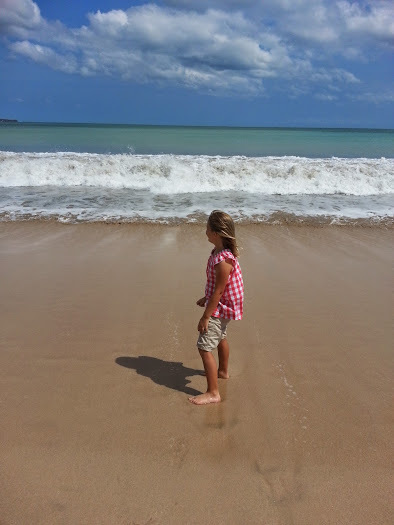 I am so glad we did, as trips to the hectic west side of Kuta and Semanyak were unpleasant. Packed beaches, people pushing you to buy their wares, and far too many westerners. Jake and Ben went to Kuta for one evening and were actually shocked by the amount of drugs that everyone tried to sell them. Pills of all kinds, weed, mushrooms – all openly displayed and pushy taxi drivers/bartenders/servers and of course the general public on the street trying to coerce them into buying. This happened even with police sitting on motorcycles clearly watching and not caring. So much for the “drugs carry a death penalty” notices that you get when entering the country! 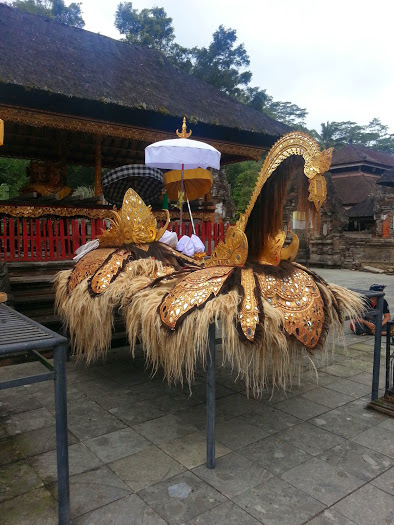 We had also toyed with staying in Ubud, which is inland and known for the arts. But I sensed it was a little too “precious” as this was the town featured in Eat, Pray, Love. And sure enough, a visit there provided support for this. There were way too many westerners in search of Zen-like experiences or alternative healing. Streets were so crowded you couldn’t walk well. But Sanur was just right. We had a hotel across the street from the beach, which meant a 5 minute walk. The main road is filled with restaurants and small shops and bars so we had plenty to do and eat. 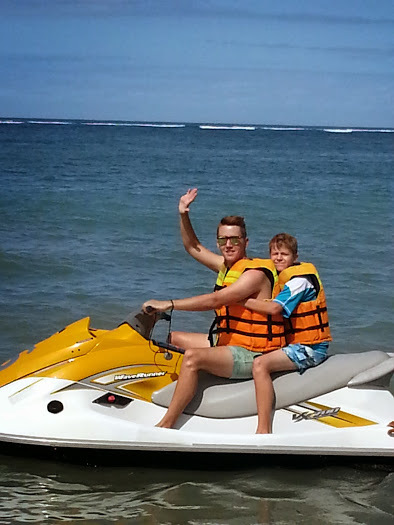 On the beach there are multiple water sports available and we did jet ski once. But it wasn’t the best as the water is quite shallow inside the reef break and was a bit nerve wracking seeing rocks and coral reef clearly visible from a jet ski. Lounge chairs under umbrellas are available to rent and cost $2.50 per day complete with a towel. They also have drinks and food for sale at many. We found one nice guy and stuck with his area. He had worked on cruise ships out of the US for 10 years so was interesting to chat to. Good restaurants were plentiful but most have very similar offerings of Indonesian highlights then some pasta, pizza, burgers, and various grilled fish and meats. 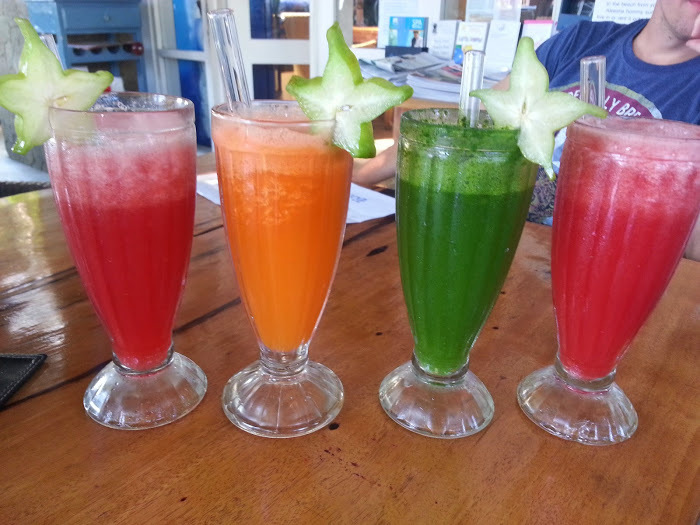 One of the best is The Three Monkeys, which used local foods in more creative and new ways. Two of our best meals were there.